Do this midstream energy giant and its fat 8.6% yield warrant a place in your portfolio? A little history will help you make the call. Energy Transfer LP (NYSE:ET) isn't the same company it was just a few months ago, when it was known as Energy Transfer Equity. That's because it merged with controlled partnership Energy Transfer Partners (and changed its name along the way). Although the name game might be a bit confusing, the end result is a simpler business with, hopefully, greater access to the capital it needs to fund long-term growth and support its huge 8.6% yield. But you need to go back further than this October 2018 merger to decide if you want to buy Energy Transfer LP. Energy Transfer LP is, without question, making the right moves to simplify its business structure. But this last move is just a step along the way, which included the merger of Energy Transfer Partners and Sunoco Logistics Partners in 2017 (Sunoco Logistics, the surviving entity, changed its name to Energy Transfer Partners following completion of the deal). Even after these two moves, though, Energy Transfer LP still has two controlled entities under its umbrella: Sunoco LP and USA Compression Partners, LP. It controls the general partners of each of these entities and has a sizable financial stake in both of them. It owns the incentive distribution rights at Sunoco LP, as well. So, while simpler, Energy Transfer LP is still a bit of a complex beast. Simply put, it is not a set-it-and-forget-it type of investment; you'll need to pay attention to what's going on beneath the covers if you buy in here. More "simplification" down the line wouldn't be a bad thing, either. That said, the partnership has been doing fairly well as of late. The third quarter was a record setter, with net income up 47% year over year. Adjusted EBITDA rose by 30%. And distributable cash flow advanced 27%, hitting a record $1.38 billion. Clearly, management's strategy for growth has been paying off. And that's not a short-term thing. Longer term, Energy Transfer LP has rewarded investors with annual distribution increases in each of the last 13 years. You have to do some things right to achieve that kind of a distribution streak. Still, it's important to dig just a little deeper than the last quarter, or a long string of distribution increases. The partnership's history dates back to 1995, when it was just a tiny midstream player. Although internal growth has been a key part of its expansion effort, the partnership's vast scale today was really driven by acquisition. The complexity of the business noted above speaks to these efforts. And while the numbers today show long-term success, one failed purchase attempt stands out as a warning. In late 2015, Energy Transfer agreed to buy The Williams Companies, Inc. (NYSE:WMB) for $37.7 billion. Unfortunately, energy prices were cratering at the time and taking the share prices of midstream companies with them. 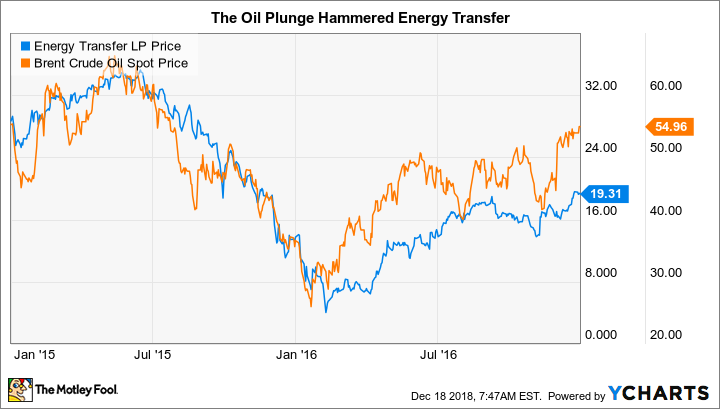 The drop in Energy Transfer's unit price was severe enough that it turned what had looked like a good deal into a big problem. Because of the price drop, selling units to fund the acquisition would have been prohibitively expensive and highly dilutive. Issuing debt, meanwhile, would likely have resulted in a distribution cut. Energy Transfer, logically, wanted to get out of the agreement, and it successfully did so. That, in and of itself, isn't a big problem and was clearly the right call. The issue is the way in which it went about scuttling the deal. In a private placement, Energy Transfer sold convertible securities. The reported purpose was to raise cash for the Williams deal. On the surface, that looks supportive of the deal. The problem is that Williams believed the convertible sale violated the terms of the acquisition agreement. The two ended up in court, and ultimately, the deal was called off. That's a compressed and simplified version of the story, but it covers the high points. It's kind of an ugly way to end a merger agreement. But here's the really unsavory bit of this story: Roughly half of the convertible sale went to Energy Transfer's CEO. And, based on the structure of the convertibles, it looked like he would have been insulated from the distribution cut that would likely have been needed if Energy Transfer completed the Williams acquisition as planned. In other words, it appears that the CEO was trying to protect himself from the worst-case scenario that his unitholders would have faced if the merger he initiated were to be completed as originally intended. You often learn more about a company when it is facing adversity than when it is achieving success, and this move was telling. Yes, Energy Transfer LP is making the right moves today to simplify and grow its business, but the actions it took to scuttle the Williams deal stand out as a warning, even though the moves avoided a worst-case scenario for the distribution. In the end, investing is about trust since you are giving your hard saved capital to other people to use. It's difficult to trust that Energy Transfer puts investors first when you look at the deal that didn't get done. For that reason, Energy Transfer LP is not a buy in my book...at least not under current management.